This just begs for the fine Bed & Breakfast treatment. You know, a tray with tiny spring flowers in a vase and a covered gourmet breakfast to be eaten outside, in the rose garden. 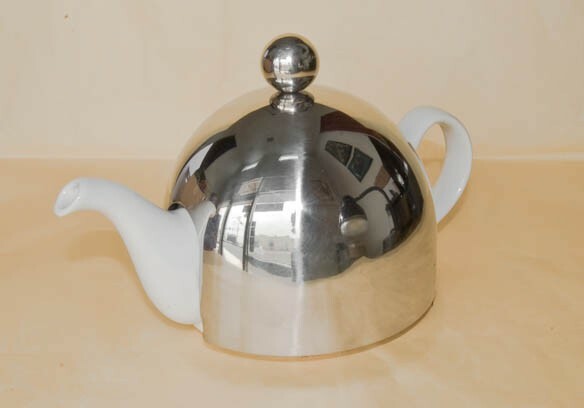 Made by Old Amsterdam Porcelain Works, the stainless steel cover over the white porcelain teapot is meant as a hip and modern alternative to fabric tea cozies for keeping your tea warm. While it apparently comes in two sizes, I think the small, two cup, personal size really has panache — and both come with a stainless steel tea infuser for loose leaf tea. It’s available all over the web but I first saw it on this site. As usual, it’s not cheap so I guess I’ll be waiting a while before I can test drive one.